Like pterosaurs, ichthyosaurs and plesiosaurs, Dimetrodon, while commonly mistaken for a dinosaur, isn't actually a dinosaur. In fact, unlike pterosaurs, ichthyosaurs and plesiosaurs, Dimetrodon isn't even a reptile, but instead belongs to a diverse group of animals that includes all modern day mammals. Seriously. Maybe I'm totally delusional but I think with a little bit of fact-checking and a commitment to accuracy we can provide educational opportunities pretty much everywhere. Perhaps it isn't such a big deal that "dinosaur" is a blanket, catch-all term to describe any and all prehistoric life - but I'm convinced we'd all appreciate our early ancestral relatives a bit more if we had a more thorough understanding of how those lifeforms came to be. Graslie expands in the video above, the latest installment of The Brain Scoop. 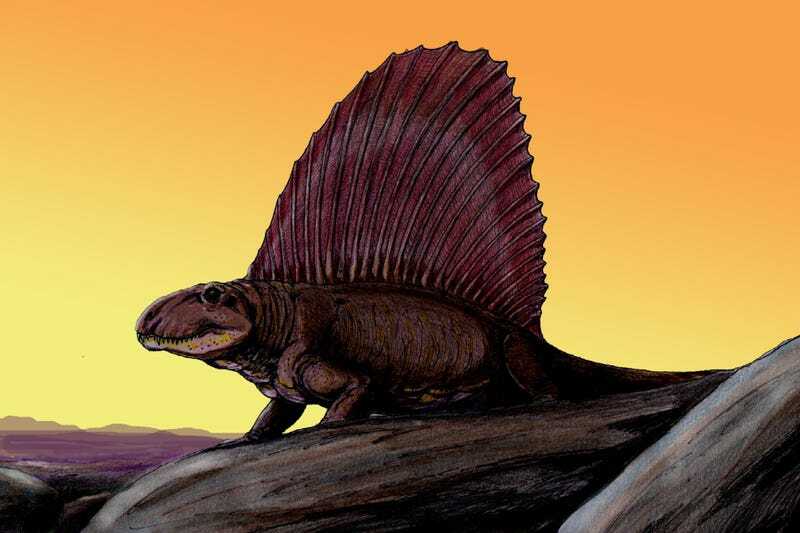 She drops a ton of knowledge on all things Dimetrodon and the incredible diversity of synapsids, and provides some great, easy-to-follow explanations on scary-sounding subjects like phylogenetics and evolutionary relationships. It's great stuff.